Check out the new merchandise here! Photo Competition – We are holding a photo competition in order to create a club calendar for 2019. 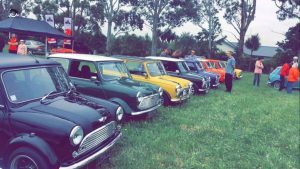 Please forward all photos showing an awesome shot of your Mini by 9th November to secretary@cmcc.org.nz and the committee will select the best shots (in our opinion!) Bribery will be accepted . The club is open to anyone with an interest in Minis of any description or Variant, Classic or BMW. We meet at various times during the year for events. Some of the events run include trials around the local area, day or night, Grasskhanas, Track days at Ruapuna with the Mini 7 racers, Runs with other clubs around the Canterbury Area. Many events have a BBQ at some stage during the time. The emphasis in the club is not on competition, but on enjoyment, although on some events the competitive spirit does become evident.